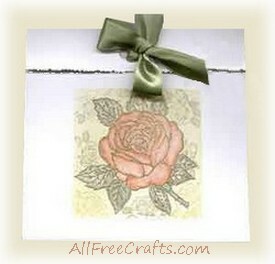 This homemade greeting card with a rose theme is both feminine and elegant; the fact that every card is individually handmade, so that each one will be a little bit different, just increases the appeal. Cut your sheet of card stock, lengthwise, so that you have a sheet of paper that measures 5 1/2 x 11 inches. Using your deckle edge scissors, cut the shortest (width) edges (2 edges) of your sheet. Cut only enough of the sheet to create a deckled edge. Lay your sheet flat (lengthwise) and fold down 1 inch from the top. Leaving your fold, folded, now fold your sheet in half. You should have a card that is folded as shown in the photo. On the left over section of card stock (you can use a lighter weight paper for this, but make sure it is at least a 67lb weight), stamp your large rose, using a pigment stamp pad. Sprinkle embossing powder over your stamped image, making sure that powder has covered all the stamped areas and then, shake away the excess powder and apply your heat gun to the powder. Apply only enough heat to raise the powder and be careful not to burn your paper. Using a craft knife, cut out your rose. Stay as close to the embossed edge as possible. You want a nice clean edge to attach this rose to your card.